In its own sneaky way, the NBA All-Star Game has something for everyone.The Weekend is looked upon as one long party, with players expected to be a part of the festivities; the game itself is a glorified exhibition, with fans expecting to see some ridiculous dunking, slick passing, and minimal defence—unless it’s of the dramatic, shot-swatting, ball-swiping variety. But then, around the third quarter, a funny thing happens: both sides feel each other out, go back and forth, and if it’s close, decide to let a real game break out. Sometimes, as in 2001, one team decides to fight what seems like a losing battle. That would be the year that the East, led to Allen Iverson and Stephon Marbury, came storming back for the upset. The NBA’s All-Star game this weekend was supposed to be a confirmation of everything Knicks star Amar’e Stoudemire has done for his new team over the past five months. He was voted a starter in the Eastern Conference, the only Knick to make the team. 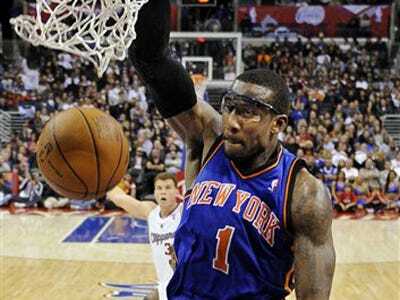 But now, there’s a complication in this celebration of all things Amar’e: He may not play. On Tuesday Mr. Stoudemire said he’s “not sure” if his sprained right toe, which kept him out of the Knicks’ win on Saturday against the New Jersey Nets, will prevent him from playing in Sunday’s game. For Amar’e, it’s not enough merely to get voted in, or have the world know that he’s an exciting player (he doesn’t need the All-Star Game to get that out there). Rather, unlike, say, Vince Carter, who used to make it every year for some dunks he did a long time ago, Stoudemire is there because he’s one of the league best. He’s everything the Knicks expected and more. Playing in the game, showing that he’s one of the alpha-dogs in that star-studded box score, means a lot. So does being on the floor late, when the game is on the line. At the end of the day, the All-Star Game is about being the best. In every way possible.